Check our Compatibility Guide if you want to know if Acrolinx for Office on Windows works with your local platforms. Acrolinx now ships a one-stop solution for Microsoft Office. Install Acrolinx for Office on Windows to use Acrolinx in Word, PowerPoint, Excel, and Outlook. Which file types can I check with the Sidebar? Acrolinx checks the data in the entire sheet if you don't use Check Selection. This includes single or merged cells, comments, and tables. How can I install, update or uninstall Acrolinx for Excel? Acrolinx for Excel comes with your Acrolinx for Office on Windows package. If you do the installation yourself, you might need to ask your Acrolinx administrator for the installer file. Close all programs, including Word, PowerPoint, Excel, and Outlook. You don't have to remove the previous version of Acrolinx for Office on Windows before installing a newer version. To upgrade Acrolinx for Office on Windows, follow the standard installation procedure. To remove Acrolinx for Office on Windows, follow the Microsoft Windows procedure for changing and removing programs. 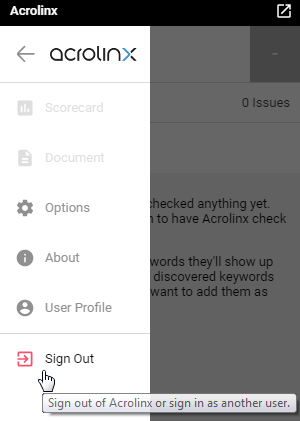 To show the Sidebar, click the Acrolinx icon in the Review ribbon in the Menu. How can I change the Sidebar interface language? The Sidebar interface appears in the same language as your Microsoft Office installation. With Check Selection in Excel, you can select parts of your document for Acrolinx to check. Switch to CHECK SELECTION - you can find it in the drop-down menu next to the CHECK button. Select the cells that you want to check. This might be a column or row, or even a single cell. To use Acrolinx for Office on Windows, you’ll need to enable Cross-Origin Resource Sharing (CORS) on your core server. Check out this article on how to Enable Cross-Origin Resource Sharing (CORS) on your Core Server. Acrolinx for Excel supports server-side content extraction processing. You can define the extraction settings by adding and uploading Content Profiles to your Core Platform. You'll need Acrolinx 5.3 or later to do this. Configure your Content Profiles using the instructions in the section Content Profiles . However, your guidance package also comes with default Content Profiles. If you use the MSI installer properties to automate the installation of Acrolinx, you can specify your Acrolinx URL. This means that writers don't have to enter this information themselves. To set your Acrolinx URL, use the property ACROLINX_SERVER_ADDRESS. ACROLINX_SERVER_ADDRESS Specify the Acrolinx URL. Note: This property works for first-time installations only. The property is ignored during an update and whichever Acrolinx URL is currently configured gets used instead. If you use the MSI installer properties to automate the installation of Acrolinx for Office, you can specify which Integrations you'd like to install. For example, you can just install the Acrolinx Integrations for Word and Excel, instead of the full Office bundle. Use the property ADDLOCAL. ADDLOCAL Specify the Acrolinx Integrations you'd like to install.